If you are looking for a camera you’ve probably heard of the MFT system where we have to main competitors: Olympus and Panasonic. I have cameras from both of them (Olympus O-MD 10 II and Lumix Panasonic G80/G85). I looked at the system, because I like photography and because of the price, lightness and because they easy to carry (smaller and not so heavier.. they say!). Olympus O-MD 10 II had a reasonable price and it’s a small camera. Also they are some nice lenses out there for it. But than I start looking into vlogging. O-MD 10 II didn’t have any microphone input so I bought Lumix G80/G85 because I’ve already had the lenses. Before entering into this system I’ve compared the prices and weight of the cameras and lenses with Nikon. I’ve suposed Canon was in the same league of price and performance. But boy I was wrong! They have a wider range of prices and lenses! At this price and weight, you can easily look in any other camera system on the market! Let’s look at Canon With The Vlogging Setup Of Famous Vloggers (like Casey Neistat)! ► Here is my link with camera sizes and weight. So this setup it’s sufficient to start filming. I’m not taking in consideration filters, microphone and so on. It’s not this article topic! And with with Canon or any other APSC/FULL FRAME CAMERA you get other juicy features and benefits! For $1400 you get all that you need to start photography and videography! I’m not advocating Canon, but I’m quite disappointing for the promises and talks around the MFT systems. I think it’s a good system for particular situations. Like a long walk or a travel vacantion. For example with Olympus and 12-100 mm lens I’m quite satisfied for this. But I know that other system can offer you similar weight and prices (see Fujifilm that I totally recommend for photography). When I bough my camera I didn’t know I would go into vlogging so I need it to decide between Olympus O-MD EM10 II and Fuji X-T20. I chose Olympus for the price and in-body stabilization (yes it’s amazing and with the 12-100 mm it’s more amazing). But on the long run I guess FUJI X-T20 was a better choice because it weights the same and has a mic input! So my advice to you before taking for granted the talks on the Internet and the advertising description is to look in all the camera systems, and decide what is important for you. For me the weight and prices are important. But in vlogging indoors where you put you’re camera on a tripod weight it’s not so important! Anyway, be aware of MFT systems! They are useful in some particular cases. And also just in some particular cases they are cheaper and lighter, but this is another talk. If you wan’t a camera that is good at everything (photography and videography) I guess you can’t go wrong with Canon. 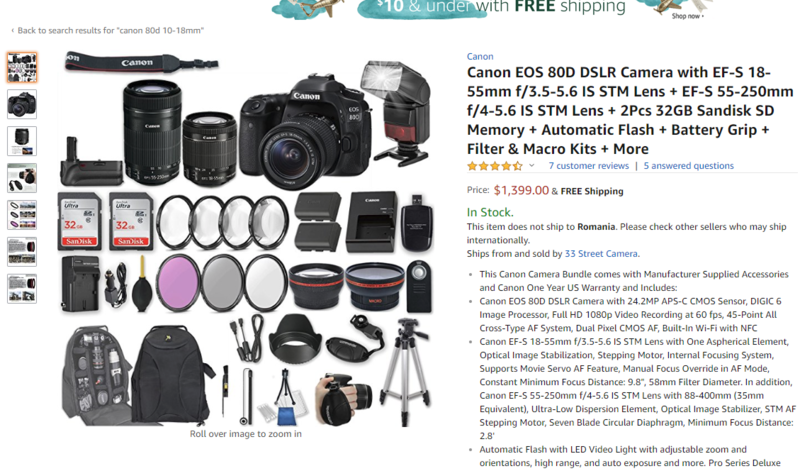 Look at Canon EOS 200D, 80D, 77D, 70D, 6D MK II! Also check their mirrorless system (Canon M50 and so on).